Orthodontic treatment lengths vary by individual. Some minor treatments can be accomplished in a few months while the treatment of more severe malocclusion can require two or more years. We do know for sure that patients can and do influence the treatment time and outcome. Excellent cooperation including good oral hygiene and home care, avoidance of damaging hard and sticky foods and candy, regular wear of removable appliances when indicated and keeping regular appointments so that we can do what is necessary to make progress, all affect the time required to complete your orthodontic treatment. Occasionally, unfavorable growth or other complications in more complex cases can prolong treatment times, but this is rare. Diagnostic Records are generally where we begin treatment. These records consist of digital photographs, study models, special orthodontic radiographs and other diagnostic information. This special information is then carefully reviewed by the doctor and is the basis upon which an individual orthodontic treatment plan can be developed and reviewed with you prior to beginning treatment. It is very important to us that you completely understand what treatment is planned before we start. Other supplemental diagnostic information is often required during treatment as part of the overall plan. Orthodontic emergencies are relatively infrequent today thanks to new materials and appliances that are designed to be more comfortable than those in the past. We are available to handle any problems which you may be experiencing with your orthodontic appliances. Please call us if you believe something is broken or if you have questions regarding your braces. Malocclusion is defined as poor positioning of the teeth. Fixed metal braces have come a long way since the previous generation. No longer are metal bands needed on all teeth to connect the fictional until (bracket) to the tooth. Today we are able to bond the bracket directly to the tooth requiring only a relatively small amount of tooth surface to be covered. A bonding bracket is secured to the tooth surface with dental bonding adhesive similar to that which is used for tooth colored fillings. The area under the bracket is sealed and protected from the outside. This means that plaque and food cannot become trapped under the bracket. It is still important however, to brush very carefully around the brackets since these areas are prone to being damaged by plaque. Ceramic braces are attached the same way and perform the same functions as metal braces. Today's ceramic (porcelain) brackets do not stain and remain the same color throughout treatment. Ceramic braces are usually recommended for older teens and adults for cosmetic reasons and work every bit as well as metal braces for moving teeth. Most patients who wear ceramic braces are pleased to report that only their close friends and relatives can tell that they are wearing braces. 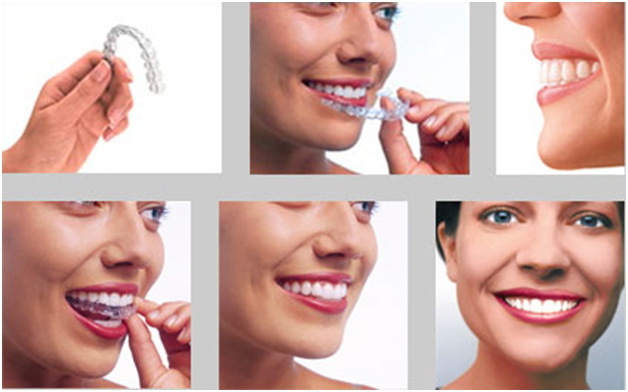 Treatment with clear aligners is now possible and we are very pleased offer this service. They are only one of many appliance types and systems within our orthodontic specialty. We have treated hundreds of cases with Invisalign with excellent results. However, these appliances are not suitable to treat all forms of malocclusion and dentofacial deformities. Fixed metal of ceramic braces may be a more appropriate treatment for correction of a malocclusion. As an orthodontic practice we are pleased to fully evaluate your needs and to recommend the best treatment option. This universally used retainer has many applications; to move teeth, close spaces, maintain alignment during or after treatment. Retainers can be utilized as active appliances to move teeth and in the case of younger patients (Phase One treatment), as a growth modification device. Removable appliances have a significant role in orthodontic treatment options and will be commended as an option if appropriate for you or your child. Retainers are also vital appliances used upon completion of the active phase of orthodontic treatment when the braces are removed. To retain means to hold. Teeth must be retained or held in their new positions while the tissues, meaning the bone, elastic membranes around the roots, the gums, tongue and lips have adapted themselves to the new tooth positions. Teeth can move if they are not retained. It is extremely important to wear your retainers as directed! 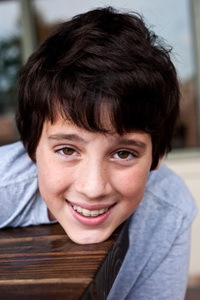 The American Association for Orthodontists recommends that every child have an orthodontic evaluation by the age of 7. Early detection and treatment gives your child the edge: a much better chance for natural and normal development. By working with the natural growth instead of against it, we can prevent problems from becoming worse, and give your child a lifetime of healthy smiles! Treatment initiated in this phase of development is often very successful and sometimes, though not always, can eliminate the need for future orthodontic treatment. Facial Development – Seventy-five percent of 12-year-olds need orthodontic treatment. Yet 90% of a child’s face has already developed! By guiding facial and dental development earlier, through the use of functional appliances, problems can be improved before the adult teeth are present! To Correct Underdeveloped or Overdeveloped Jaws – Almost 55% of children who need orthodontic treatment due to a bad bite have underdeveloped or overdeveloped upper or lower jaws. Functional appliances and/or limited braces can reposition the jaws, improving the child’s profile and improving the bite problem.